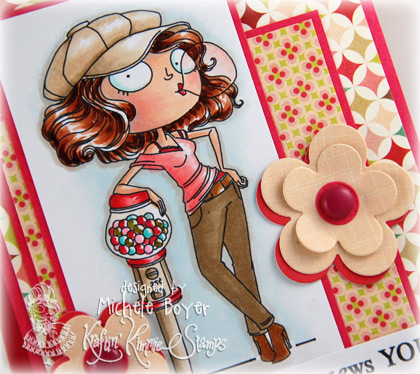 Welcome to Kraftin Kimmie Stamps‘ August release! 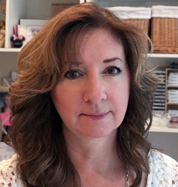 We have lots of fun new images this month… Cheryl Alger has created a super cute and slightly spooky Halloween Lulu set. Emilie Goulet has two adorable new sets — Too Cute to Spook 1 and 2. And Annie has created six really fun Candy Girl images. And, of course, there are new Halloween Trinkets designed by Nicole Aspinall. You’ll see most of the new images throughout the hop. If you just popped in here, you may want to start at the beginning HERE. Be sure to leave comments as you go because two lucky winners will each receive a package of assorted stamps from the release! Today I’ve used Bambi Bubblegum. You can find all of this month’s new release images here. Gimme Kimmies Kits are available here for a limited time (grouped together by artist and available at a discount). Thanks for stopping by! Happy hopping…and shopping! Stamps: Kraftin Kimmie Stamps “Bambi Bubblegum” (Moonlight Whispers) Ink: Memento Tuxedo Black Paper: Prism Intense Pink, X-Press It Blending Card, Echo Park “This & That” (6×6) Accessories: Copic markers (E00, E11, BV000, R20, E13, E15, E18, E41, E43, R22, R24, R37, BG10, BG70, BG13, YG95, W00, W1), Copic 0.25 black multiliner, My Favorite Things Pretty Posies Die-namics, brads. Finished size 4 1/4″ x 5 1/2″. Super card, love your coloring, and this image is fantastic! Your coloring is super – and looking back at your showcase of earlier cards, I just love the Lulu ones! Wow…stunning card…just love this image…and your colouring is truly AWESOME !! Thanks for sharing !! So cute! This sassy girl is right up there as being one of my faves from this release and you’ve done a bang-up job on your card! So sassy! What a super collection of candy girls…..have my eye on a couple of them. Love the card layout. I can see that this cutie is a favorite already! Your card is so great – your colors are true bubble gum colors! Wishing you a relaxing Sunday! Bambi is just so cute! Love your colouring skills too! wow the way you color up an image just blows me away!…Bambi is terrific! What a sweet card. You’ve done a beautiful job coloring and I love the DPaper you chose. Gorgeous card Michele!! Bambi is definitely one of my favs from this release. This is an absolutely fabulous card Michele!! I love it! Gorgeous card! Love your papers/colors! 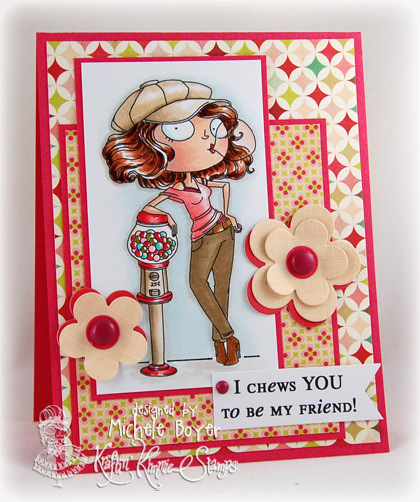 such a great card…love the gumball machine. Great card! I love all of the bright colors. Great card! The colours are perfect for that image! Your colouring always leaves me in awe! Seriously amazing girl!